The ubiquitous pallet, the workhorse of the logistics sector, is being given a makeover through a collaboration between German chemicals firm BASF and Dutch start-up company Ahrma Holding. Based on the Internet of things (IoT), where objects are embedded with electronics to enable exchange of data, the companies are launching a completely new pallet with a tracking and tracing device, something not been done in the 50-year history of pallets. A transponder is integrated with the pallets and using software from Ahrma, Supply Chain Big Data (SCBD system), a company is able to record not just the position and movement of the pallets, but also their ambient temperature and load state and any possible impact or dropping of the pallets. 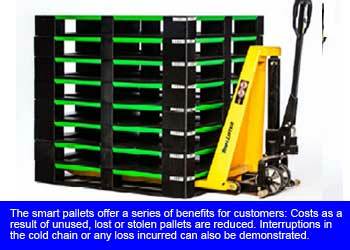 Benefits are that unused pallets can be located and optimum use can be guaranteed. Costs as a result of unused, lost or stolen pallets are reduced. Interruptions in the cold chain or any loss incurred can also be demonstrated and processes improved accordingly. The pallets remain the property of Ahrma and are loaned to customers as required. BASF, which is participating at K2016 under the theme of ideas becoming ideal solutions, supplies the Elastocoat C spray system that seals the pallet surfaces to protect against water, dirt, microbial infestation and abrasion. The hybrid pallets are made from medium density fibreboard (MDF) and plastic. BASF’s PU coating has been developed further and can now be sprayed on directly in continuous, automated spraying units. There is no need for any further primer coat. The company also says that the MDF pallets are not just more stable but around 25% lighter than traditional pallets. The life span of the pallets is extended considerably to up to ten years and individual components of the pallets can be dismantled and replaced. “There have not been any innovations in the pallet industry for more than 50 years. 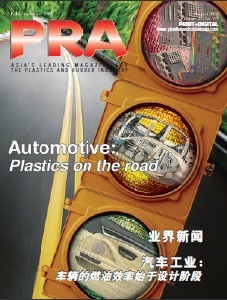 Our solution is to lease reusable smart pallets on attractive terms,” explains Erik de Bokx, CEO of Ahrma Holding. In addition, thanks to the coating, the pallets can be cleaned and thus reused quickly. This is an attribute that is particularly important especially for customers in the food, beverages and pharmaceutical sectors. Elastocoat C is also resistant to chemicals, flexible, crack bridging and wear-resistant. It is resistant to low temperatures, quickly hardens following application, and offers a non-slip surface, which makes the load even more secure. The customised Greenpanel MDF blanks for the pallets are supplied by the company Makers B.V. The concept of MDF panels sprayed with Elastocoat is also used in exhibition stand construction, for example, as a floor panel with an appropriately adapted shape.